(1) THE FIRST PART is a Book of Evil Spirits, called GOETIA, showing how he bound up those Spirits and used them in several things, whereby he obtained great fame. (2) THE SECOND PART is a Book of Spirits, partly Good and partly Evil, which is named THEURGIA-GOETIA, all Spirits of the Ayre (air), etc. 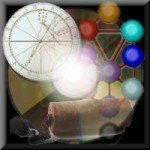 (3) THE THIRD PART is a Book governing the Planetary Houses, and what Spirits belong to every Degree of the Signs, and Planets in the Signs called the Pauline Art. (4) THE FOURTH PART is a Book called the ALMADEL OF SOLOMON, which contains Twenty Chief Spirits who govern the Four Altitudes, or the 360 Degrees of the Zodiac or the world or signs &c. These two last Orders of Spirits are Good, and is called the true THEURGIA, and is to be sought after by Divine seeking &c.
The 5th part is a Booke of cautions and prayers that wise Salomon used upon the Altar in the Temple which is called Artem Novom, the which was Revealed to Salomon by the holy angel of God, called Michele; and he allso received manye breefe notes writen by the finger of God; which was delivered to him by the said Angel with thunder claps; without which nots Salomon obtained to his great knowledge, for by them in short toime he knew all arts and sciences both good and bad; from these Notes it is called the Notory Art, &c.
In this booke is Contained the Hole Art of Salomon; Although there be many other books that is said to be his yet none is to be compared with this for this contains them all although they be so liked with severale other names as the book Relique which is the very same as this last is, which is called Artem Novem and the Notory Art, &c.
These Bookes was first found in the Chaldan and Hebrew Tongues at Jerusalem by a Jewish Rabbi; and by him put into the Greek language and thence into the Latin, as it is said, &c.
The Second Spirit is a Duke called Agares. He is under the Power of the East, and cometh up in the form of an old fair Man, riding upon a Crocodile very mitely, carrying a Goshawk upon his fist, and yet mild in appearance. He maketh them to run that stand still, and bringeth back runaways. He teaches all Languages or Tongues presently. He hath power also to destroy Dignities both Spiritual and Temporal, and causeth Earthquakes. He was of the Order of Virtues. He hath under his government 31 Legions of Spirits. And this is his Seal or Character which thou shalt wear as a Lamen before thee. The Seventh Spirit is Amon. He is a Marquis great in power, and most stern. He appeareth like a Wolf with a Serpent’s tail, vomiting out of his mouth flames of fire; but at the command of the Magician he putteth on the shape of a Man with Dog’s teeth beset in a head like a Raven; or else like a Man with a Raven’s head (simply). He telleth all things Past and to Come. He procureth feuds and reconcileth controversies between friends. He governeth 40 Legions of Spirits. His Seal is this which is to be worn as aforesaid, etc. The Ninth Spirit in this Order is Paimon, a Great King, and very obedient unto LUCIFER. He appeareth in the form of a Man sitting upon a Dromedary with a Crown most glorious upon his head. There goeth before him also an Host of Spirits, like Men with Trumpets and well sounding Cymbals, and all other sorts of Musical Instruments. He hath a great Voice, and roareth at his first coming, and his speech is such that the Magician cannot well understand unless he can compel him. This Spirit can teach all Arts and Sciences, and other secret things. He can discover unto thee what the Earth is, and what holdeth it up in the Waters; and what Mind is, and where it is; or any other thing thou mayest desire to know. He giveth Dignity, and confirmeth the same. He bindeth or maketh any man subject unto the Magician if he so desire it. He giveth good Familiars, and such as can teach all Arts. He is to be observed towards the West. He is of the Order of Dominations. 13 He hath under him 200 Legions of Spirits, and part of them are of the Order of Angels, and the other part of Potentates. Now if thou callest this Spirit Paimon alone, thou must make him some offering; and there will attend him two Kings called LABAL and ABALI , and also other Spirits who be of the Order of Potentates in his Host, and 25 Legions. And those Spirits which be subject unto them are not always with them unless the Magician do compel them. His Character is this which must be worn as a Lamen before thee, etc. The Tenth Spirit is Buer, a Great President. He appeareth in Sagittary, and that is his shape when the Sun is there. He teaches Philosophy, both Moral and Natural, and the Logic Art, and also the Virtues of all Herbs and Plants. He healeth all distempers in man, and giveth good Familiars. He governeth 50 Legions of Spirits, and his Character of obedience is this, which thou must wear when thou callest him forth unto appearance. 13 Or Dominions, as they are usually termed. The Eleventh Spirit in order is a great and strong Duke, called Gusion. He appeareth like a Xenopilus. He telleth all things, Past, Present, and to Come, and showeth the meaning and resolution of all questions thou mayest ask. He conciliateth and reconcileth friendships, and giveth Honour and Dignity unto any. He ruleth over 40 Legions of Spirits. His Seal is this, the which wear thou as aforesaid. The Thirteenth Spirit is called Beleth (or Bileth, or Bilet). He is a mighty King and terrible. He rideth on a pale horse with trumpets and other kinds of musical instruments playing before him. He is very furious at his first appearance, that is, while the Exorcist layeth his courage; for to do this he must hold a Hazel Wand in his hand, striking it out towards the South and East Quarters, make a triangle, Ò, without the Circle, and then command him into it by the Bonds and Charges of Spirits as hereafter followeth. And if he doth not enter into the triangle, Ò, at your threats, rehearse the Bonds and Charms before him, and then he will yield Obedience and come into it, and do what he is commanded by the Exorcist. Yet he must receive him courteously because he is a Great King, and do homage unto him, as the Kings and Princes do that attend upon him. And thou must have always a Silver Ring on the middle finger of the left hand held against thy face, 14 as they do yet before AMAYMON. This Great King Beleth causeth all the love that may be, both of Men and of Women, until the Master Exorcist hath had his desire fulfilled. He is of the Order of Powers, and he governeth 85 Legions of Spirits. His Noble Seal is this, which is to be worn before thee at working. The Fourteenth Spirit is called Leraje (or Leraie). He is a Marquis Great in Power, showing himself in the likeness of an Archer clad in Green, and carrying a Bow and Quiver. He causeth all great Battles and Contests; and maketh wounds to putrefy that are made with Arrows by Archers. This belongeth unto Sagittary. He governeth 30 Legions of Spirits, and this is his Seal, etc. The Seventeenth Spirit is Botis, a Great President, and an Earl. He appeareth at the first show in the form of an ugly Viper, then at the command of the Magician he putteth on a Human shape with Great Teeth, and two Horns, carrying a bright and sharp Sword in his hand. He telleth all things Past, and to Come, and reconcileth Friends and Foes. He ruleth over 60 Legions of Spirits, and this is his Seal, etc. The Eighteenth Spirit is Bathin. He is a Mighty and Strong Duke, and appeareth like a Strong Man with the tail of a Serpent, sitting upon a Pale-Coloured Horse. He knoweth the Virtues of Herbs and Precious Stones, and can transport men suddenly from one country to another. He ruleth over 30 Legions of Spirits. His Seal is this which is to be worn as aforesaid. The Twentieth Spirit is Purson, a Great King. His appearance is comely, like a Man with a Lion’s face, carrying a cruel Viper in his hand, and riding upon a Bear. Going before him are many Trumpets sounding. He knoweth all things hidden, and can discover Treasure, and tell all things Past, Present, and to Come. He can take a Body either Human or Aërial, and answereth truly of all Earthly things both Secret and Divine, and of the Creation of the World. He bringeth forth good Familiars, and under his Government there be 22 Legions of Spirits, partly of the Order of Virtues and partly of the Order of Thrones. His Mark, Seal, or Character is this, unto the which he oweth obedience, and which thou shalt wear in time of action, etc. The Twenty-first Spirit is Marax. He is a Great Earl and President. He appeareth like a great Bull with a Man’s face. His office is to make Men very knowing in Astronomy, and all other Liberal Sciences; also he can give good Familiars, and wise, knowing the virtues of Herbs and Stones which be precious. He governeth 30 Legions of Spirits, and his Seal is this, which must be made and worn as aforesaid, etc. The Twenty-second Spirit is lpos. He is an Earl, and a Mighty Prince, and appeareth in the form of an Angel with a Lion's Head, and a Goose's Foot, and Hare's Tail. He knoweth all things Past, Present, and to Come. He maketh men witty and bold. He governeth 36 Legions of Spirits. His Seal is this, which thou shalt wear, etc,. The Twenty-third Spirit is Aim. He is a Great Strong Duke. He appeareth in the form of a very handsome Man in body, but with three Heads; the first, like a Serpent, the second like a Man having two Stars on his Forehead, the third like a Calf. He rideth on a Viper, carrying a Firebrand in his Hand, wherewith he setteth cities, castles, and great Places, on fire. He maketh thee witty in all manner of ways, and giveth true answers unto private matters. He governeth 26 Legions of Inferior Spirits; and his Seal is this, which wear thou as aforesaid, etc. The Twenty-fourth Spirit is Naberius. He is a most valiant Marquis, and showeth in the form of a Black Crane, fluttering about the Circle, and when he speaketh it is with a hoarse voice. He maketh men cunning in all Arts and Sciences, but especially in the Art of Rhetoric. He restoreth lost Dignities and Honours. He governeth 19 Legions of Spirits. His Seal is this, which is to be worn, etc. The Twenty-sixth Spirit is Bune. He is a Strong, Great and Mighty Duke. He appeareth in the form of a Dragon with three heads, one like a Dog, one like a Gryphon, and one like a Man. He speaketh with a high and comely Voice. He changeth the Place of the Dead, and causeth the Spirits which be under him to gather together upon your Sepulchres. He giveth Riches unto a Man, and maketh him Wise and Eloquent. He giveth true Answers unto Demands. And he governeth 30 Legions of Spirits. His Seal is this, unto the which he oweth Obedience. He hath another Seal or character which is made thus; you may use which you will; but the first is the best as Salomon saith. The Twenty-seventh Spirit is Ronove. He appeareth in the Form of a Monster. He teacheth the Art of Rhetoric very well and giveth Good Servants, Knowledge of Tongues, and Favours with Friends or Foes. He is a Marquis and Great Earl; and there be under his command 19 Legions of Spirits. His Seal is this, etc. The Twenty-eighth Spirit in Order, as Solomon bound them, is named Berith. He is a Mighty, Great, and Terrible Duke. He hath two other Names given unto him by men of later times, viz. : BEALE, or BEAL, and BOFRY or BOLFRY. He appeareth in the Form of a Soldier with Red Clothing, riding upon a Red Horse, and having a Crown of Gold upon his head. He giveth true answers, Past, Present, and to Come. Thou must make use of a Ring in calling him forth, as is before spoken of regarding Beleth. 17 He can turn all metals into Gold. He can give Dignities, and can confirm them unto Man. He speaketh with a, very clear and subtle Voice. He governeth 26 Legions of Spirits. His Seal is this, etc. The Thirtieth Spirit is Forneus. He is a Mighty and Great Marquis, and appeareth in the Form of a Great Sea-Monster. He teacheth, and maketh men wonderfully knowing in the Art of Rhetoric. He causeth men to have a Good Name, and to have the knowledge and understanding of Tongues. He maketh one to be beloved of his Foes as well as of his Friends. He governeth 29 Legions of Spirits, partly of the Order of Thrones, and partly of that of Angels. His Seal is this, which wear thou, etc. The Thirty-third Spirit is Gaap. He is a Great President and a Mighty Prince. He appeareth when the Sun is in some of the Southern Signs, in a Human Shape, going before Four Great and Mighty Kings, as if lie were a Guide to conduct them along on their way. His Office is to make men Insensible or Ignorant; as also in Philosophy to make them Knowing, and in all the Liberal Sciences. He can cause Love or Hatred, also he can teach thee to consecrate those things that belong to the Dominion of AMAYMON his King. He can deliver Familiars out of the Custody of other Magicians, and answereth truly and perfectly of things Past, Present, and to Come. He can carry and re-carry men very speedily from one Kingdom to another, at the Will and Pleasure of the Exorcist. He ruleth over 66 Legions of Spirits, and he was of the Order of Potentates. His Seal is this to be made and to be worn as aforesaid, etc. The Thirty-fourth Spirit is Furfur. He is a Great and Mighty Earl, appearing in the Form of an Hart with a Fiery Tail. He never speaketh truth unless he be compelled, or brought up within a triangle, Ò. Being therein, he will take upon himself the Form of an Angel. Being bidden, he speaketh with a hoarse voice. Also he will wittingly urge Love between Man and Woman. He can raise Lightnings and Thunders, Blasts, and Great Tempestuous Storms. And he giveth True Answers both of Things Secret and Divine, if commanded. He ruleth over 26 Legions of Spirits. And his Seal is this, etc. The Thirty-fifth Spirit is Marchosias. He is a Great and Mighty Marquis, appearing at first in the Form of a Wolf 18 having Gryphon’s Wings, and a Serpent’s Tail, and Vomiting Fire out of his mouth. But after a time, at the command of the Exorcist he putteth on the Shape of a Man. And he is a strong fighter. He was of the Order of Dominations. He governeth 30 Legions of Spirits. He told his Chief, who was Solomon, that after 1,200 years he had hopes to return unto the Seventh Throne. 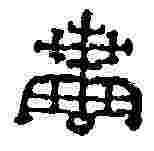 And his Seal is this, to be made and worn as a Lamen, etc. The Thirty-Seventh Spirit is Phenex (or Pheynix). He is a great Marquis, and appeareth like the Bird Phoenix, having the Voice of a Child. He singeth many sweet notes before the Exorcist, which he must not regard, but by-and-by he must bid him put on Human Shape. Then he will speak marvellously of all wonderful Sciences if required. He is a Poet, good and excellent. And he will be willing to perform thy requests. He hath hopes also to return to the Seventh Throne after 1,200 years more, as he said unto Solomon. He governeth 20 Legions of Spirits. And his Seal is this, which wear thou, etc. The Thirty-eighth Spirit is Halphas, or Malthous (or Malthas). He is a Great Earl, and appeareth in the Form of a Stock-Dove. He speaketh with a hoarse Voice. His Office is to build up Towers, and to furnish them with Ammunition and Weapons, and to send Men-of-War 19 to places appointed. He ruleth over 26 Legions of Spirits, and his Seal is this, etc. The Fortieth Spirit is Raum. He is a Great Earl; and appeareth at first in the Form of a Crow, but after the Command of the Exorcist he putteth on Human Shape. His office is to steal Treasures out King’s Houses, and to carry it whither he is commanded, and to destroy Cities and Dignities of Men, and to tell all things, Past and What Is, and what Will Be; and to cause Love between Friends and Foes. He was of the Order of Thrones. He governeth 30 Legions of Spirits; and his Seal is this, which wear thou as aforesaid. The Forty-first Spirit is Focalor, or Forcalor, or Furcalor. He is a Mighty Duke and Strong. He appeareth in the Form of a Man with Gryphon’s Wings. His office is to slay Men, and to drown them in the Waters, and to overthrow Ships of War, for he hath Power over both Winds and Seas; but he will not hurt any man or thing if he be commanded to the contrary by the Exorcist. He also hath hopes to return to the Seventh Throne after 1,000 years. He governeth 30 Legions of Spirits, and his Seal is this, etc. The Forty-second Spirit is Vepar, or Vephar. He is a Duke Great and Strong and appeareth like a Mermaid. His office is to govern the Waters, and to guide Ships laden with Arms, Armour, and Ammunition, etc., thereon. And at the request of the Exorcist he can cause the seas to be right stormy and to appear full of ships. Also he maketh men to die in Three Days by Putrefying Wounds or Sores, and causing Worms to breed in them. He governeth 29 Legions of Spirits, and his Seal is this, etc. The Forty-third Spirit, as King Solomon commanded them into the Vessel of Brass, is called Sabnock, or Savnok. He is a Marquis, Mighty, Great and Strong, appearing in the Form of an Armed Soldier with a Lion’s Head, riding on a pale-coloured horse. His office is to build high Towers, Castles and Cities, and-to furnish them with Armour, etc. Also he can afflict Men for many days with Wounds and with Sores rotten and full of Worms. He giveth Good Fam-iliars at the request of the Exorcist. He com-mandeth 50 Legions of Spirits; and his Seal is this. The Forty-fourth Spirit is Shax, or Shaz (or Shass). He is a Great Marquis and appeareth in the Form of a Stock-Dove, speaking with a voice hoarse, but yet subtle. His Office is to take away the Sight, Hearing, or Understanding of any Man or Woman at the command of the Exorcist; and to steal money out of the houses of Kings, and to carry it again in 1,200 years. If commanded he will fetch Horses at the request of the Exorcist, or any other thing. But he must first be commanded into a Triangle, Ò, or else he will deceive him, and tell him many Lies. He can discover all things that are Hidden, and not kept by Wicked Spirits. He giveth good Familiars, sometimes. He governeth 30 Legions of Spirits, and his Seal is this, etc. The Forty-fifth Spirit is Vine, or Vinea. He is a Great King, and an Earl; and appeareth in the Form of a Lion, 20 riding upon a Black Horse, and bearing a Viper in his hand. His Office is to discover Things Hidden, Witches, Wizards, and Things Present, Past, and to Come. He, at the command of the Exorcist will build Towers, overthrow Great Stone Walls, and make the Waters rough with Storms. He governeth 36 Legions of Spirits. 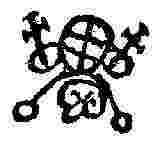 And his Seal is this, which wear thou, as aforesaid, etc. The Forty-seventh Spirit Uvall, or Vual, or Voval. He is a Duke, Great, Mighty, and Strong; and appeareth in the Form of a Mighty Dromedary at the first, but after a while at the Command of the Exorcist he putteth on Human Shape, and speaketh the Egyptian Tongue, but not perfectly. 21 His Office is to procure the Love of Woman, and to tell Things Past, Present, and to Come. He also procureth Friendship between Friends and Foes. He was of the Order of Potestates or Powers. He governeth 37 Legions of Spirits, and his Seal is this, to be made and worn before thee, etc. The Forty-eighth Spirit is Haagenti. He is a President, appearing in the Form of a Mighty Bull with Gryphon’s Wings. This is at first, but after, at the Command of the Exorcist he putteth on Human Shape. His Office is to make Men wise, and to instruct them in divers things; also to Transmute all Metals into Gold; and to change Wine into Water, and Water into Wine. He governeth 33 Legions of Spirits, and his Seal is this, etc. The Forty-ninth Spirit is Crocell, or Crokel. He appeareth in the Form of an Angel. He is a Duke Great and Strong, speaking something Mystically of Hidden Things. He teacheth the Art of Geometry and the Liberal Sciences. He, at the Command of the Exorcist, will produce Great Noises like the Rushings of many Waters, although there be none. He warmeth Waters, and discovereth Baths. He was of the Order of Potestates, or Powers, before his fall, as he declared unto the King Solomon. He governeth 48 Legions of Spirits. His Seal is this, the which wear thou as aforesaid. The Fifty-first Spirit is Balam or Balaam. He is a Terrible, Great, and Powerful King. He appeareth with three Heads: the first is like that of a Bull; the second is like that of a Man; the third is like that of a Ram. He hath the Tail of a Serpent, and Flaming Eyes. He rideth upon a furious Bear, and carrieth a Boshawk upon his Fist. He speaketh with a hoarse Voice, giving True Answers of Things Past, Present, and to Come. He maketh men to go Invisible, and also to be Witty. He governeth 40 Legions of Spirits. His Seal is this, etc. The Fifty-second Spirit is Alloces, or Alocas. He is a Duke, Great, Mighty, and Strong, appearing in the Form of a Soldier 22 riding upon a Great Horse. His Face is like that of a Lion, very Red, and having Flaming Eyes. His Speech is hoarse and very big. 23 His Office is to teach the Art of Astronomy, and all the Liberal Sciences. He bringeth unto thee Good Familiars; also he ruleth over 36 Legions of Spirits. His Seal is this, which, etc. The Fifty-fourth Spirit is called Murmur, or Murmus, or Murmux. He is a Great Duke, and an Earl; and appeareth in the Form of a Warrior riding upon a. Gryphon, with a Ducal Crown upon his Head. There do go before him those his Ministers, with great Trumpets sounding. His Office is to teach Philosophy perfectly, and to constrain Souls Deceased to come before the Exorcist to answer those questions which he may wish to put to them, if desired. He was partly of the Order of Thrones, and partly of that of Angels. He now ruleth 30 Legions of Spirits. And his Seal is this, etc. The Fifty-sixth Spirit is Gremory, or Gamori. He is a Duke Strong and Powerful, and appeareth in the Form of a Beautiful Woman, with a Duchess’s Crown tied about her waist, and riding on a Great Camel. His Office is to tell of all Things Past, Present, and to Come; and of Treasures Hid, and what they lie in; and to procure the Love of Women both Young and Old. He governeth 26 Legions of Spirits, and his Seal is this, etc. The Fifty-seventh Spirit is Oso, Ose, or Voso. He is a Great President, and appeareth like a Leopard at the first, but after a little time he putteth on the Shape of a Man. His Office is to make one cunning in the Liberal Sciences, and to give True Answers of Divine and Secret Things; also to change a Man into any Shape that the Exorcist pleaseth, so that he that is so changed will not think any other thing than that he is in verity that Creature or Thing he is changed into. He governeth 30 24 Legions of Spirits, and this is his Seal, etc. The Fifty-eighth Spirit is Amy, or Avnas. He is a Great President, and appeareth at first in the Form of a Flaming Fire; but after a while he putteth on the Shape of a Man. His office is to make one Wonderful Knowing 25 in Astrology and all the Liberal Sciences. He giveth Good Familiars, and can bewray Treasure that is kept by Spirits. He governeth 36 Legions of Spirits, and his Seal is this, etc. The Fifty-ninth Spirit is Oriax, or Orias. He is a Great Marquis, and appeareth in the Form of a Lion, 26 riding upon a Horse Mighty and Strong, with a Serpent’s Tail; and he holdeth in his Right Hand two Great Serpents hissing. His Office is to teach the Virtues of the Stars, and to know the Mansions of the Planets, and how to understand their Virtues. He also transformeth Men, and he giveth Dignities, Prelacies, and Confirmation thereof; also Favour with Friends and with Foes. He doth govern 30 Legions of Spirits; and his Seal is this, etc. The Sixtieth Spirit is Vapula, or Naphula. He is a Duke Great, Mighty, and Strong; appearing in the Form of a. Lion with Gryphon’s Wings. His Office is to make Men Knowing in all Handcrafts and Professions, also in Philosophy, and other Sciences. He governeth 36 Legions of Spirits, and his Seal or Character is thus made, and thou shalt wear it as aforesaid, etc. (62.) VOLAC, or VALAK, or VALU, or VALAC. - The Sixty-second Spirit is Volac, or Valak, or Valu. He is a President Mighty and Great, and appeareth like a Child with Angel’s Wings, riding on a Two-headed Dragon. His Office is to give True Answers of Hidden Treasures, and to tell where Serpents may be seen. The which he will bring unto the Exorciser without any Force or Strength being by him employed. He governeth 38 Legions of Spirits, and his Seal is thus. (64.) HAURES, or HAURAS, or HAVRES, or FLAUROB. The Sixty-fourth Spirit is Haures, or Hauras, or Havres, or Flauros. He is a Great Duke, and appeareth at first like a Leopard, Mighty, Terrible, and Strong, but after a while, at the Command of the Exorcist, he putteth on Human. Shape with Eyes Flaming and Fiery, and a most Terrible Countenance. He giveth True Answers of all things, Present, Past, and to Come. But if he be not commanded into a Triangle, Ò, he will Lie in all these Things, and deceive and beguile the Exorcist in these things, or in such and such business. He will, lastly, talk of the Creation of the World, and of Divinity, and of how he and other Spirits fell. He destroyeth and burneth up those who be the Enemies of the Exorcist should he so desire it; also he will not suffer him to be tempted by any other Spirit or otherwise. He governeth 36 Legions of Spirits, and his Seal is this, to be worn as a Lamen, etc. The Sixty-fifth Spirit is Andrealphus. He is a Mighty Marquis, appearing at first in the form of a Peacock, with great Noises. But after a time he putteth on Human shape. He can teach Geometry perfectly. He maketh Men very subtle therein; and in all Things pertaining unto Mensuration or Astronomy. He can transform a Man into the Likeness of a Bird. He governeth 30 Legions of Infernal Spirits, and his Seal is this, etc. The Sixtysixth Spirit is Cimejes, or Cimeies, or Kimaris. He is a Marquis, Mighty, Great, Strong and Powerful, appearing like a Valiant Warrior riding upon a goodly Black Horse. He ruleth over all Spirits in the parts of Africa. His Office is to teach perfectly Grammar, Logic, Rhetoric, and to discover things Lost or Hidden, and Treasures. He governeth 20 Legions of Infernals; and his Seal is this, etc. The Sixty-seventh Spirit is Amdusias, or Amdukias. He is a Duke Great and Strong, appearing at first like a Unicorn, but at the request of the Exorcist he standeth before him in Human Shape, causing Trumpets, and all manner of Musical Instruments to be heard, but not soon or immediately. Also he can cause Trees to bend and incline according to the Exorcist’s Will. He giveth Excellent Familiars. He governeth 29 Legions of Spirits. And his Seal is this, etc. The Sixty-ninth Spirit is Decarabia. He appeareth in the Form of a Star in a Pentacle, at first; but after, at the command of the Exorcist, he putteth on the image of a Man. His Office is to discover the Virtues of Birds and Precious Stones, and to make the Similitude of all kinds of Birds to fly before the Exorcist, singing and drinking as natural Birds do. He governeth 30 Legions of Spirits, being himself a Great Marquis. And this is his Seal, which is to be worn, etc. The Seventy-first Spirit is Dantalion. He is a Duke Great and Mighty, appearing in the Form of a Man with many Countenances, all Men’s and Women’s Faces; and he hath a Book in his right hand. His Office is to teach all Arts and Sciences unto any; and to declare the Secret Counsel of any one; for he knoweth the Thoughts of all Men and Women, and can change them at his Will. He can cause Love, and show the Similitude of any person, and show the same by a Vision, let them be in what part of the World they Will. He governeth 36 Legions of Spirits; and this is his Seal, which wear thou, etc. THESE be the 72 Mighty Kings and Princes which King Solomon Commanded into a Vessel of Brass, together with their Legions. Of whom BELIAL, BILETH, ASMODAY, and GAAP, were Chief. And it is to be noted that Solomon did this because of their pride, for he never declared other reason why he thus bound them. And when he had thus bound them up and sealed the Vessel, he by Divine Power did chase them all into a deep Lake or Hole in Babylon. And they of Babylon, wondering to see such a thing, they did then go wholly into the Lake, to break the Vessel open, expecting to find great store of Treasure therein. But when they had broken it open, out flew the Chief Spirits immediately, with their Legions following them; and they were all restored to their former places except BELIAL, who entered into a certain Image, and thence gave answers unto those who did offer Sacrifices unto him, and did worship the Image as their God, etc.